The Duke and Duchess of Sussex have joined the Queen for the Trooping the Colour parade to mark her 92nd birthday. Prince Harry and his new wife Meghan, who married last month, arrived as part of the carriage procession. Prince Philip, who retired from royal duties last year, did not attend the military parade. He turns 97 on Sunday. Field Marshal Lord Guthrie fell from his horse during the parade and has been taken to hospital. Lord Guthrie, 79, is the former head of the Army and then Chief of Defence Staff, the UK's most senior military officer. The Duke and Duchess of Sussex joined senior royals including Prince Charles and the Duke and Duchess of Cambridge for the event in London. Large crowds of spectators gathered to watch Saturday's ceremony, which saw about 1,000 soldiers march to Horse Guards Parade in Whitehall. 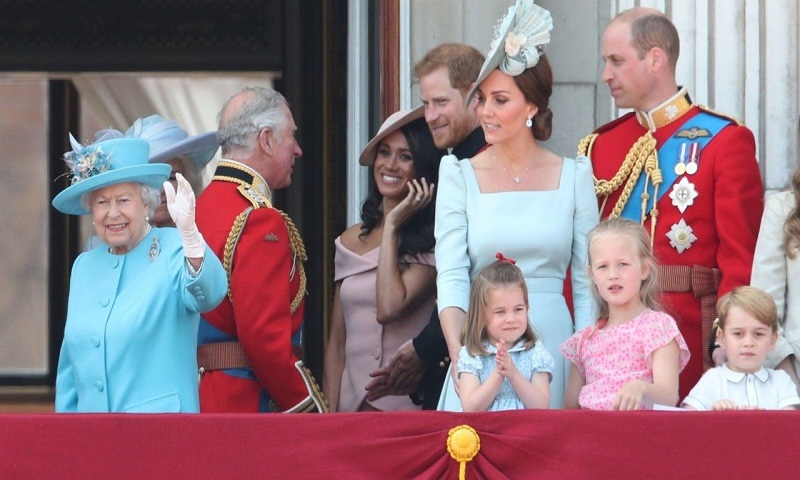 The Duke and Duchess of Cambridge's young children, Prince George and Princess Charlotte, looked out over the crowds, standing next to Savannah and Isla - the Queen's great-granddaughters. The Duchess of Cornwall and Duchess of Cambridge arrived together as part of a carriage procession along the Mall. They were followed by the Duke and Duchess of Sussex and the Queen's cousin, the Duke of Kent, in a second carriage which was greeted by cheering crowds. The Countess of Wessex, her daughter Lady Louise and princesses Beatrice and Eugenie travelled in the third carriage. Trooping the Colour has commemorated the birthday of the sovereign for more than 250 years and also functions as a display of army drills, music and horsemanship. There had been fears that Field Marshal Lord Guthrie's fall from the horse may have altered timings for the RAF flypast, but the Royal Family's balcony appearance went ahead as planned. Among the soldiers who took part was Guardsman Charanpreet Singh Lall, a 22-year-old Sikh from Leicester, who became the first soldier to wear a turban in the parade's history. The Queen, who celebrated her 92nd birthday on 21 April, recently had surgery to remove a cataract from her eye. She and 7,500 guests watched the ceremony - which will this year parade the flag of the 1st Battalion Coldstream Guards - from a dais in Horse Guards before inspecting the guardsmen. Among the guests was Defence Secretary Gavin Williamson and US Defence Secretary General James Mattis. The Queen has travelled every Trooping the Colour of her reign except in 1955 when it was cancelled because of strike action. Afterwards, the King's Troop Royal Horse Artillery fired a 41-gun salute in Green Park to mark the official birthday. The Duchess of Sussex wore an off-the-shoulder dress designed by Carolina Herrera and a hat by milliner Philip Treacy. The Duchess of Cambridge wore an Alexander McQueen and a hat by Juliette Botterill. Later this month, the Duchess of Sussex will accompany the Queen on a royal engagement to officially open a theatre and bridge in Cheshire. It will be the first time the duchess has joined the Queen for an event without her husband. The couple attended a garden party at Buckingham Palace on 22 May for their first royal engagement as a married couple.